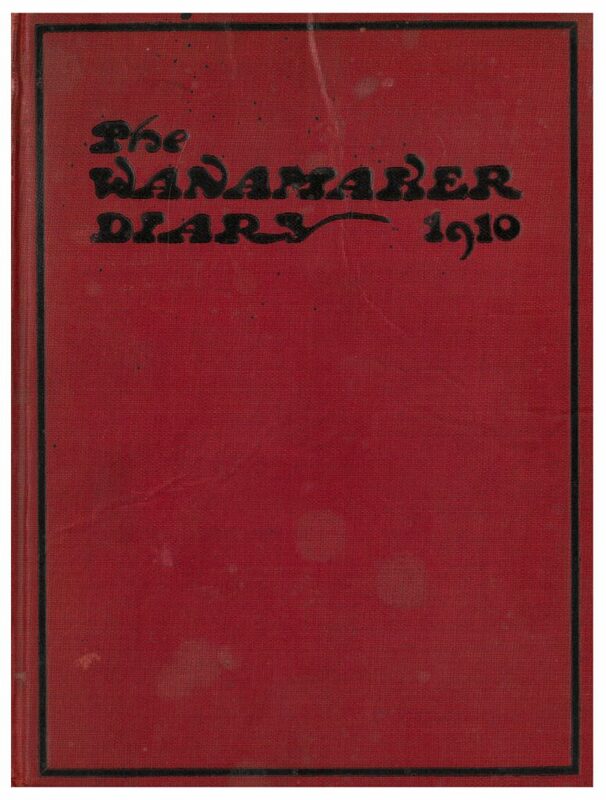 Recently while browsing the Trade Literature Collection, I came across the Wanamaker Diary from 1910. It instantly caught my eye because I remember going to the Wanamaker’s department store in Philadelphia as a child with my grandmother. Those shopping trips, which included a ride on the trolley, always felt like an adventure. Opening up the Wanamaker Diary brought back a lot of memories, like walking into the store and seeing the large organ and huge eagle in the Grand Court and having ice cream in the cafe overlooking the balcony. Even as a child, I was aware that Wanamaker’s had been around for many, many years. So, now, discovering this piece of trade literature from 1910 especially intrigued me. After a quick flip through the Wanamaker Diary, it appeared to be a combination trade catalog and diary. Included on the title page is a calendar from 1910. John Wanamaker, Philadelphia, PA. Wanamaker Diary, 1910, front cover. 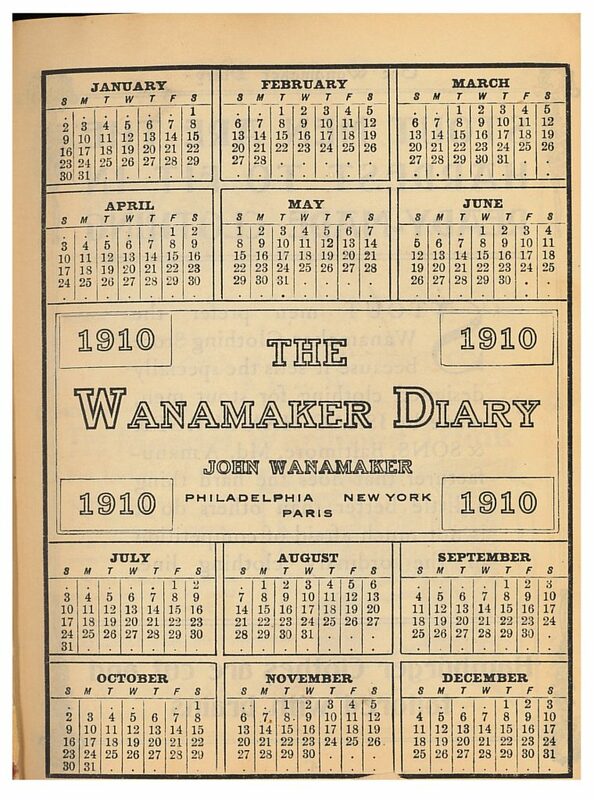 John Wanamaker, Philadelphia, PA. Wanamaker Diary, 1910, title page with 1910 calendar. It continues with several illustrations of seating arrangements for various theatres, such as the Academy of Music and Astor Theatre. 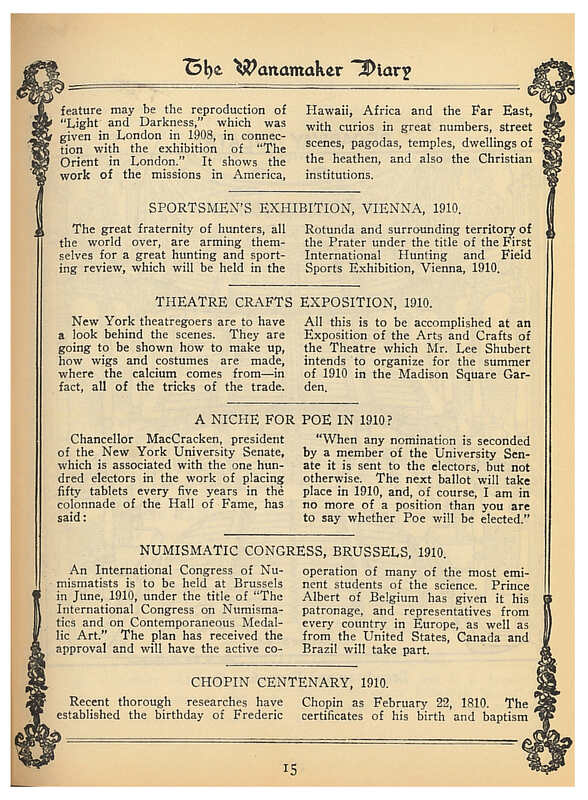 Other pages give advice, such as “How to Make Geranium Cuttings.” There are also announcements about upcoming events for 1910, like this page below with announcements for the Numismatic Congress in Brussels and the Theatre Crafts Exposition in New York. John Wanamaker, Philadelphia, PA. Wanamaker Diary, 1910, page 15, announcements of events to be held in 1910 throughout the world. The diary part is set up so that the diary pages always appear on the right page. Each diary page includes two dates with a quote for each day. There are also several blank lines under each day to record thoughts, ideas, plans, etc. The left page tends to give information such as current news or advertisements for products. Some of the advertisements mention that the products were sold at Wanamaker’s department stores, like the example below. The left page advertises a desk sold by John Wanamaker while the right page is the diary page for Thursday January 13 and Friday January 14. 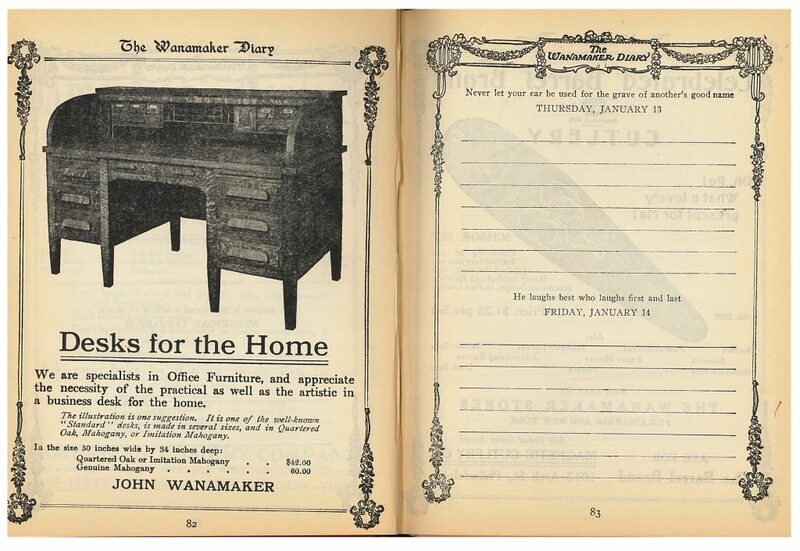 John Wanamaker, Philadelphia, PA. Wanamaker Diary, 1910, pages 82-83, advertisement for a desk (left page) and diary page for Thursday January 13 and Friday January 14 (right page). Flipping through the Wanamaker Diary, it didn’t take long to start recognizing company names in the advertisements. Catalogs for some of these companies can be found in the Trade Literature Collection at the National Museum of American History Library. One of the companies is Dennison Mfg. Co. 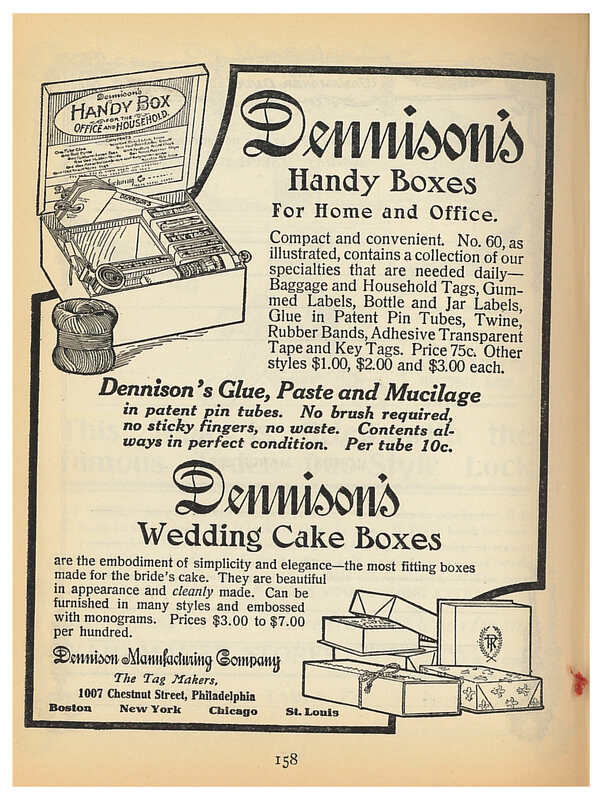 The page below, found in the Wanamaker Diary, advertises Dennison’s Handy Boxes and Dennison’s Wedding Cake Boxes. The Trade Literature Collection includes several Dennison Mfg. Co. catalogs with ideas for party decorations and weddings. John Wanamaker, Philadelphia, PA. Wanamaker Diary, 1910, page 158, advertisement for Dennison’s Handy Boxes and Dennison’s Wedding Cake Boxes from Dennison Mfg. Co. The Wanamaker Diary for 1910 and other John Wanamaker catalogs are located in the Trade Literature Collection at the National Museum of American History Library. Way to highlight some really neat stuff, Alexia. I like the daily advice at the header of the diary pages, and I wouldn’t mind that oak desk if I could still find one!